The aerial vehicles plant trees 10 times faster than humans for half the price. Love or hate ’em, it’s impossible to criticize the noble service drones are providing in regions of Southeast Asia. A group of villagers and a local nonprofit organization in Myanmar are recruiting a fleet of drones to help replant 2.7 million trees in an endangered ecosystem, according to a Fast Company report. 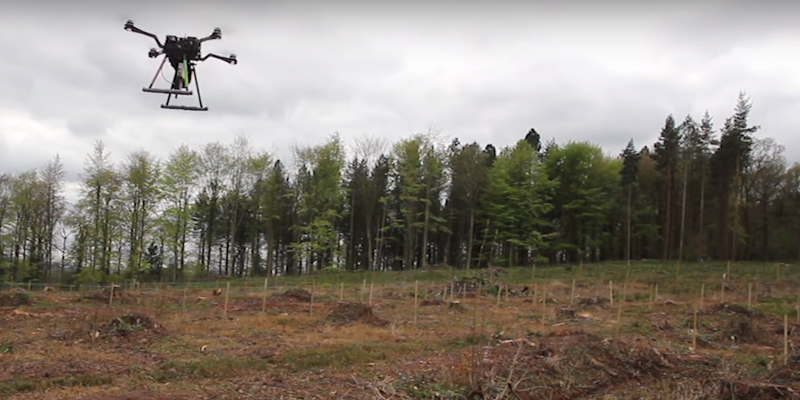 The drones, built by BioCarbon Engineering, are capable of planting 100,000 trees in a single 24-hour period. This lets villagers focus more on growing the trees and keeping them healthy instead of on the painstaking task of individually planting them. BioCarbon Engineering has planted enough trees to fill a 750 hectares area, or around twice the size of Central Park (an American football field is about .53 hectares). The goal in Myanmar is for the drones to plant a million more trees on another 250 hectares of land. Aerial flexibility and reliability make drones excellent gardeners. But before they can be deployed, researchers must first use satellite imagery to select an operating area. A fixed-wing drone is then launched to help survey the land, searching for obstructions, existing biodiversity, and topography. The data gathered from those recon missions is used to program a flight path that avoids potential obstructions and determines the best species and locations to plant. This seed pod is activated by moisture after it’s dropped from the sky by a drone. The drones, flying low on their programmed route, shoot biodegradable nutrient-filled seed pods with enough force for them to penetrate the ground and plant seeds within centimeters of accuracy. The aerial vehicles are capable of planting trees at least 10 times faster than a human at half the cost. In Myanmar (also known as Burma), where brackish water sits along coastlines, most of those trees are mangroves. As Fast Company points out, mangroves are important in the region because they provide a sanctuary for fish. More than 75 percent of mangroves were lost in the 1990s, and the fish population declined dramatically. Even though a single drone pilot is potentially capable of planting 100,000 seeds a day, there is still a lot of work to do to meet the ambitious goals outlined in the Paris Climate Agreement. According to Nature, in order to reach the Paris agreement’s goal of limiting the global temperature rise to 2 degrees Celsius, between 430 million and 580 million trees would need to be planted—about half the land area of the United States.